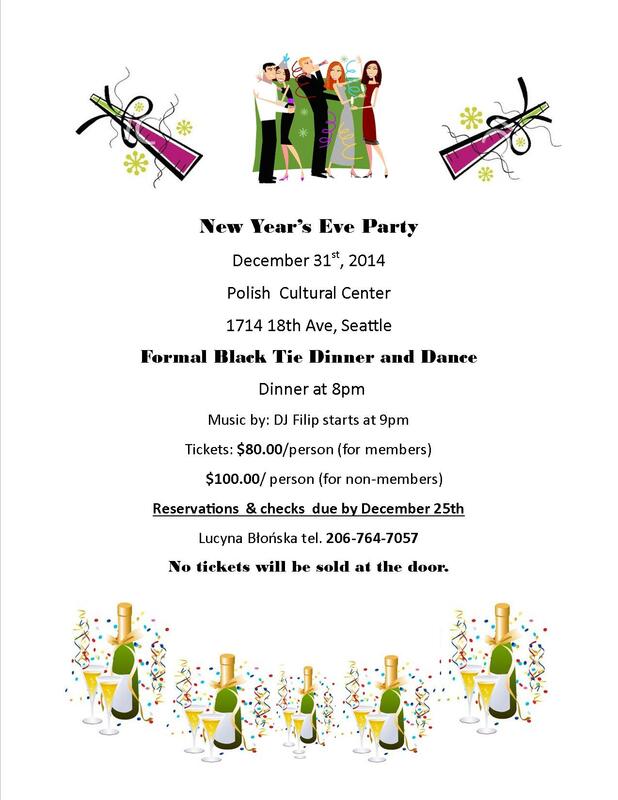 This is the yearly New Year's Eve party organized by the Polish Home Association. This year dancing will be at the upper hall with music by DJ Filip. Dinner will be available at 8 pm, music from 9 pm to 1 am. Where: at the Polish Cultural Center Dom Polski; tickets $80 PHA members, $100 non-members. Reservations & checks due by December 25, 2014. No tickets will be sold at the door. More: For reservations and more info please contact Lucyna Blonska or call her at 206-764-7057. As is the tradition, the St. Stanislaus Choir will sing Polish carols at the Festival of Lights at the Grotto in Portland. The Grotto Festival features over 150 choral concerts over several days and weeks. This is a wonderful opportunity to listen to Christmas music from many different countries, including carols from Poland. Where: at the Grotto, at NE 85th & Sandy Blvd, Portland, OR; tickets $10, $9 and $5. The Polish Cultural Center restaurant will be closed for Christmas on December 21, 26, 28 and Jan 2. It will reopen on Jan 9, 2015. 'Tis the season: the popular workshops with Alisa Lahti are back! 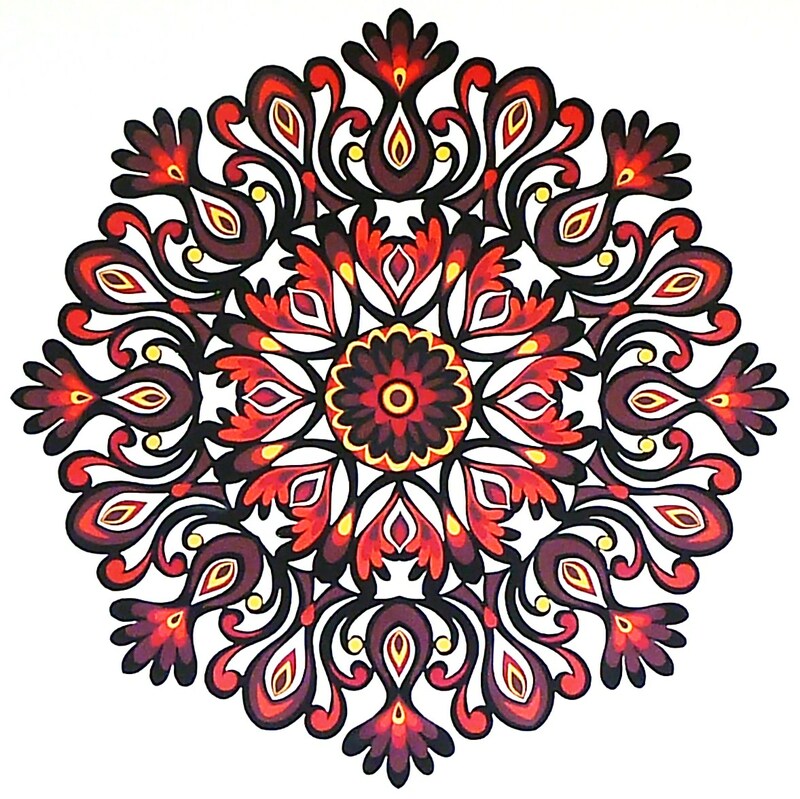 In this 4 hour workshop you will design and create your own 8 or 16 sided mandala / gwiazda / star style of circular paper-cut. This is a fun and meditative process that yields beautiful and compelling results. Ms. Lahti will share her techniques for folding, cutting and adding colorful layers. All materials included with the fee and tools are provided for your use. Limited to 4-6 people, so register early! This is a Christmas brunch of the Polish Book Club in Seattle. It is also an open house meeting where every book lover is invited to drop by - no reading necessary and you will enjoy great Polish food and a nice company of fellow readers. There will also be an opportunity to buy Polish books at discounted prices. On Dec 13, 1981, General Jaruzelski introduced the martial law to break the Solidarity movement and suppress nascent democracy in Poland. On the 33rd anniversary, the Polish Home Association presents a film documenting planning, preparations and implementation of that operation. It also discusses its justifications, including the Soviet intervention threat. This film doesn't have English subtitles. This is a Mikolajki party for kids, organized by the Polish Cultural Center. There will be a friendly competition with awards open to all children to perform a carol or say a little poem. A Santa Claus visit will be a highlight of the event. The restaurant will be open from 1 pm to 4 pm. 'Tis the season: the popular workshops with Alisa Lahti are back! This 3 hour workshop offers the opportunity to learn more about the beautiful art form of Polish paper-cutting while you complete 1-3 of your own wycinanki projects. Ms. Lahti will share tips and techniques, including modifying a template to create your own unique design. Materials included with the fee and tools are provided. Limited to 4-6 people so sign up early!. 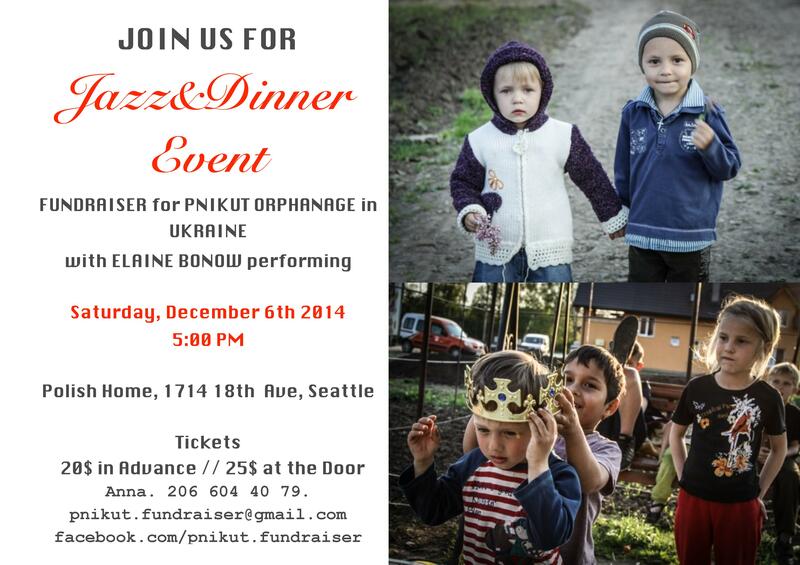 This is a jazz concert with vocals by Seattleite singer Elaine Bonow that is a fundraiser for an Ukrainian orphanage in Pnikut. Pnikut is a Polish Roman Catholic Parish in the Lviv / Lwow region with history going back to 14c. The orphanage is a little village of 5 houses organized with help from the Lviv Archdioceses. Please help the children while enjoying a jazz concert and a dinner! This event was organized by Anna Horodetska. Update: fundraiser was very successful - over $3,250 was raised. Thank you making the difference! This is a Mikolajki party for children, organized by the Polish School in Bellevue. The program includes traditional Jaselka (a Nativity based short play) performed by the students of the school, a Santa Claus visit, sharing of Christmas wafers and sweat treats, as well as signing of Polish carols with live music provided by musician friends and students. Every child is welcome! More: Polish School in Bellevue (PL), or contact Anna Cholewinska at 425-736-1209.